This active, forward-thinking couple bought a new house in order to “right-size” for the next chapter in their lives. They found a ranch home in a neighborhood they liked, but the floor plan needed a remodel in order to fit their lifestyle. Two small bedrooms were combined in order to make one large master. 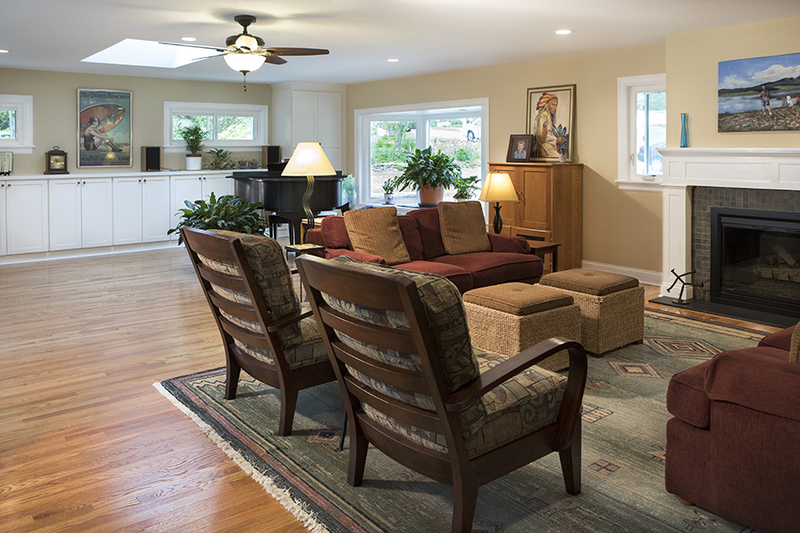 The existing living room and garage were combined to make one large living space. The floor of the garage was raised to be on an equal plane to the existing living room. Hardwood was added to match the existing flooring and then all was refinished for a fresh look. A large ViWinco Bay Window was added where the garage door once was, and a Velux Solar Skylight was installed to add to the natural sunlight coming from the bay. Custom built-ins lined the furthest wall for storage and closet space. Sliding doors were installed as an entrance and exit to the back of the existing house. 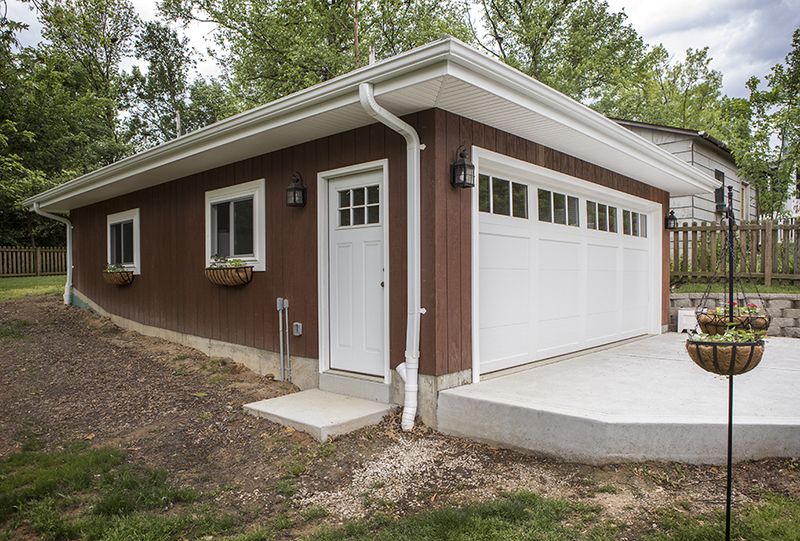 A new extended length garage was added for the owner’s vehicles with spare room for the homeowners brewing experiments. Azek window and door trim surrounded the newly installed ViWinco windows along with Cedar Siding mimicking the house. 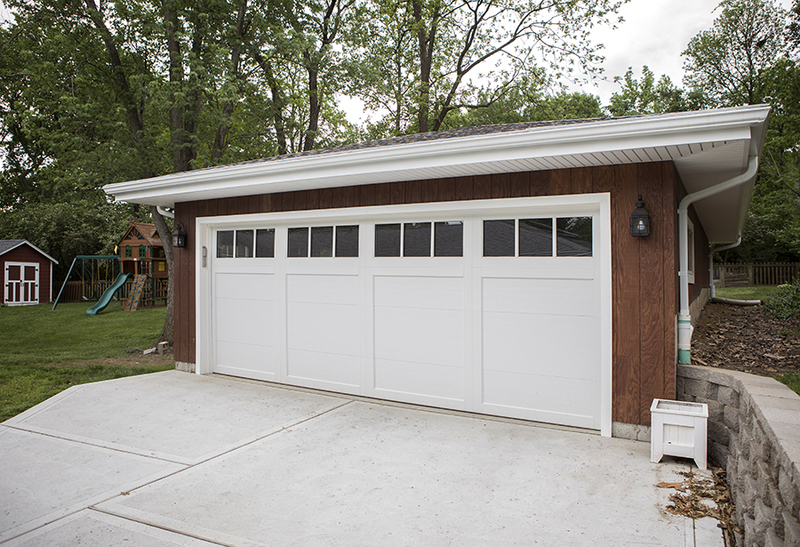 Liftmaster Garage Doors were installed with dual controls for the car and a spare for safety and easy entry. These two people are much too busy with their jobs and their many hobbies, from beer brewing, to gardening, and everything in between. But they needed a place where grandchildren could hang out and watch a movie when they came to visit. 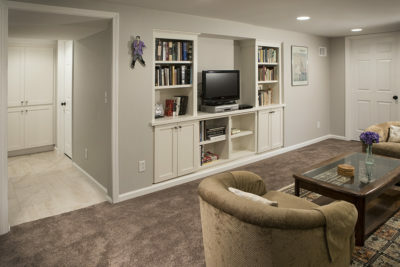 A part of their basement was finished into a perfect space with a lot of storage for games, books, movies and any other toys or crafts that may need to be stored for frequent visits. Custom bookshelves lined two walls and one was designed for the television and all its components. The area was carpeted and a hall was created with tile to another storage cabinet for linens. A nice basement bathroom was created opposite to the laundry area. A Sterling Accord, 60” Seated Shower was installed in the bathroom with a Moen 4-functioning massaging hand shower with slide bar for the shower feature. A Wellborn select vanity was selected with upgraded solid wood, dovetail drawers. Moen’s hardware on the cabinets compliments the brushed nickel plumbing fixtures in Moen’s Voss Series. The Highline Kohler comfort height toilet, along with the Grip-tight Cachet seat added to the practicality, along with the beauty of this basement bath. A Verdera Kohler mirrored cabinet was installed, giving this homeowner more storage for all those bathroom essentials. Kohler was also installed in this remodel, as the Caxton sink is a bathroom favorite among many of our clients. The Caesar stone countertop in Urban Safari, along with the 12” X 12” Castelbianco Nasino Ivory tile flooring, softens the look and brings it all together. This wonderful couple can now concentrate on their gardening and savoring the long days of summer.